Oh, how I loved Charlotte Brontë after reading her infamous classic Jane Eyre! Now I have finally read another of her novels, Villette, and do I love her just as much? No. I actually think I love her more, if that's even possible. After living with her godmother for some time, Lucy Snowe must leave and find work. Her limited amount of options eventually leads her to a school in a French town called Villette, where she will pick up a job as a teacher and reside there for the years to come. Lucy must overcome countless obstacles, the most overwhelming being loneliness and the hurt and jealousy caused by unrequited love. At times Villette is a very dreary ride, but Lucy's strength and feminism makes it as empowering as it is. Even now, the premise and outcome of this story are so groundbreaking and realistic; it's unlike anything I've ever read, and in essence, perfect. If I'm saying this in the twenty first century, I can't begin to imagine what it would've been like to read this when it first came out in 1853. Brontë had a lot of ambition. And these characters are just so vivid! M. Paul Emanuel is certainly a fascinating specimen, and I loved watching his character develop over time. Even when he became more likeable, he was still so spazzy and imperfect; I loved it. But no one could ever steal our heroine's thunder. It's just as easy to admire Lucy as it is to sympathize with her because she's so honest about her struggles. She doesn't pretend to be stronger than she is, and that in turn makes her stronger to some degree. Lucy is also a very religious woman and is in the minority as a Protestant at the school she teaches English at. Villette is full of Lucy's criticism toward religious hypocrisy, especially what she found in Catholicism. This story also has a bit of a mysterious paranormal element, for the school is haunted by the apparition of a nun. This both intrigued and amused me because even though seeing seemingly random apparitions would scare just about anybody, I sometimes wonder if Lucy was simply afraid because it was a nun, or as she put it - the NUN. While the ending left me rereading the last couple pages in disbelief, I realize that Villette is not a sob story. It's a story that centers around someone who searches for independence and finds it. It pains me, however, to see what life was like for women in the mid 1800s. Lucy Snowe shows us that being a feminist in this period makes it all the more difficult; I can't fathom how Charlotte must've been feeling when she wrote this. It must've been deep and inspiring, and where would we be if she didn't put pen to paper? Anyone in need of a unique piece of literature must pick up Villette to quench the thirst. I must admit though that reading Villette wasn't always the easiest venture. The first half of the novel is a bit of a slower read in some spots, but the second half is quite exciting and emotional. 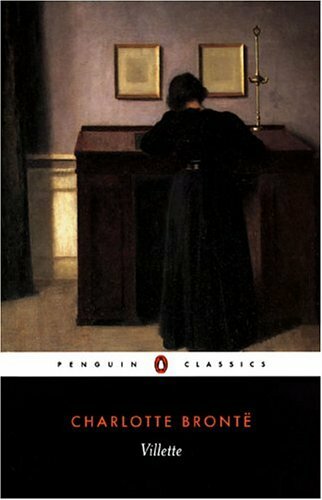 Toward the end, my heart lit up as it did when I read Jane Eyre; Charlotte Brontë has a profound way of dropping a match on my heart with her stories. Between all the FEELINGS and her sense of feminism, I will love her forever. None can even think of touching the top of her pedestal.